When you’re traveling a little off the grid, having the best portable water filter makes a world of difference. Once you start bringing a portable water filter with you on your trips, it’s a game changer. You don’t have to lug heavy jugs of water on your camping and hiking trips anymore. Just use your filter to fill the water recipient while you’re on the go. As if that wasn’t good enough news, the best portable water filters pay for themselves in no time. That’s right. You’ll actually be reducing your expenses in the long run. Instead of buying bottles water at marked up prices, simply use the water filter you have to make stream or river water drinkable. The best portable waters we found make nearly every type of fresh water source drinkable. All of them are durable and get the job done well. They’re easy to use and affordable too which is so important for the budget-minded traveler. When you're on the go, travel accessories like this make all of the difference. In this article, we will take a look at some of the top choices on the market that you can use on the go. 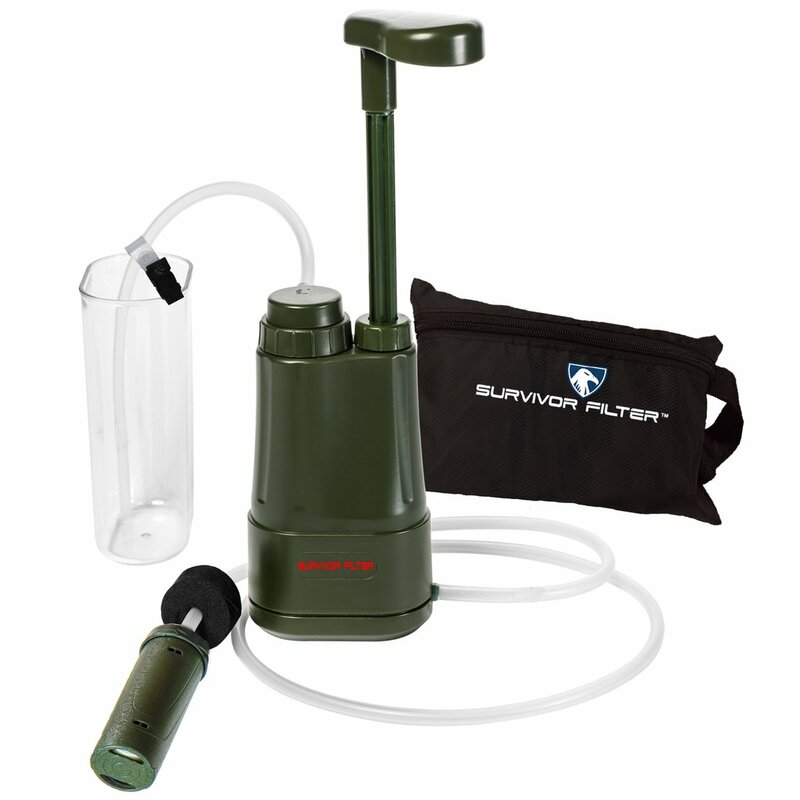 When Would Having a Portable Water Filter Be Beneficial? Drinking clean water is integral to maintaining your health as you explore the great outdoors. Remember that once you start bringing your portable filter around, you won’t have to carry as much of a heavy water supply. While it’s true that not all water sources are unsafe, even drinking water from the clearest stream can make you sick. As more of us explore nature, contamination levels rise. 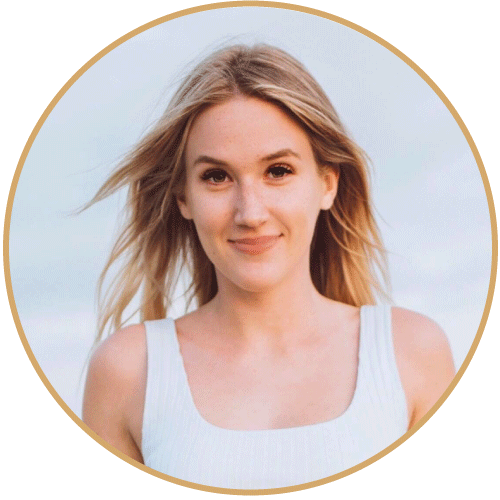 It's an unfortunate coincidence but the good news is that there are ways to combat it.The primary way to do so is to use the best portable water filters wherever and whenever possible. The best portable water filters come in handy when you’re camping, hiking, biking, and simply just out and about in nature. Just a heads up though. 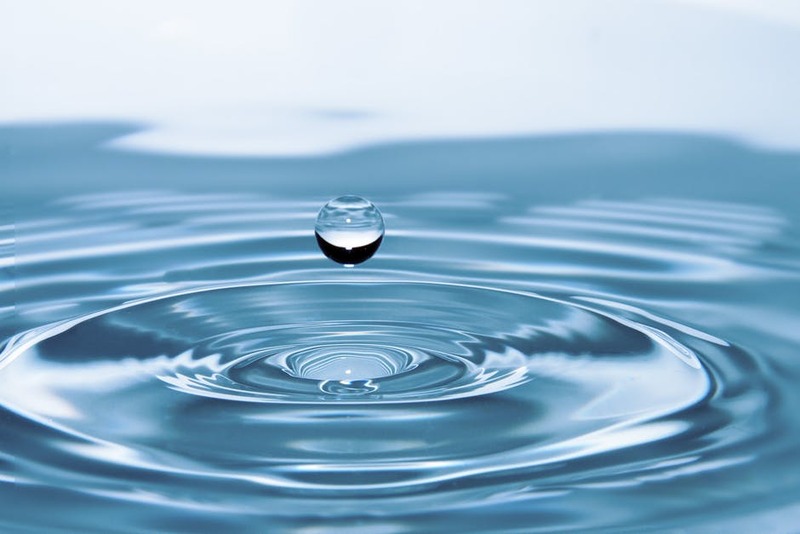 There is a difference between a water filter and a water purifier. Water filters function to sift out protozoan cysts (aka biological pathogens). Purifiers, on the other hand, combat viruses which are most likely too small for water filters to catch. When it comes to choosing the best portable water filters, one of the most important factors is ease of use. If you buy a device and try to use it for the first time while you’re on the hike, good luck. But then again, it shouldn’t be that complicated. Buy a device that is easy to take with you and use on the go. Before you begin to go through our list, there should be a few things to keep in mind and ask yourself. What is your price range? What type of water filter do you want? How long will you be using it for? Enjoy safe drinking anytime and anywhere. This water filter straw from Etekcity can filter up to 1,500 liters of water. This is one of the best portable water filters because it offers three different filtration stages. The first one eliminates contaminants like bacteria, metal ions, chlorine, and other pollutants. When you’re on the go, this is one of the best travel accessories for safe, drinkable water. There’s no need to go thirsty. Just stick the straw in a body of fresh water and sip. 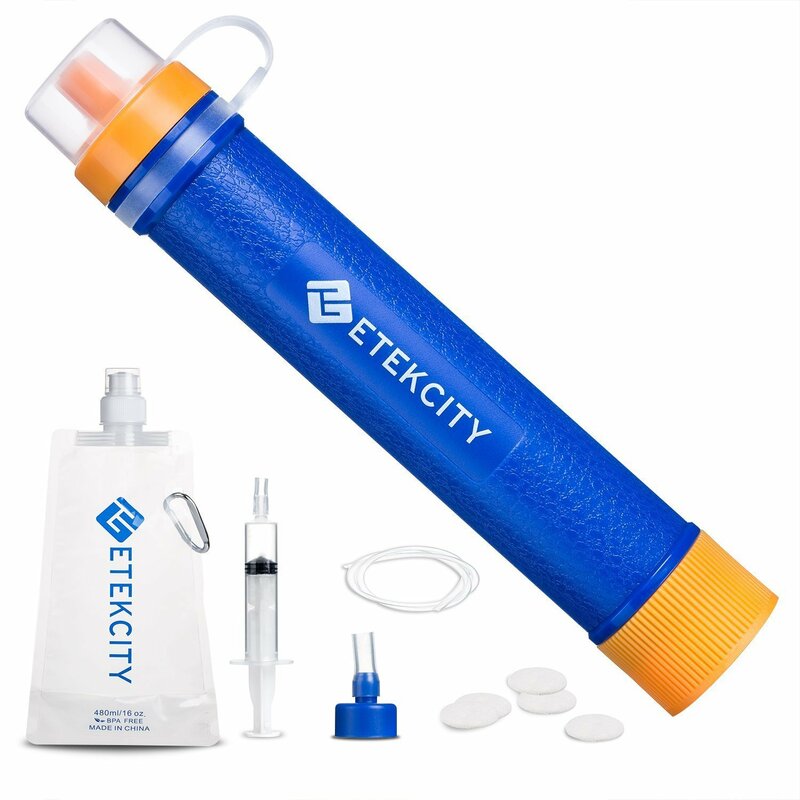 With the ​Etekcity Personal Water Filter Straw, you can access clean drinking water by taking it directly from the source. All you have to do is attached the pre-filter and extension tube to the purifier. Then, take a sip. When you’re on the move, this 16-ounce water pouch can also be used as a hydration pack. Just clip it to your bag for easy access. Once you’ve drank your fill, fill up the cleaning syringe with clean water to wash it out. This will not only keep the purifier ready for next time but also extend its lifetime. The three stages of filtration are pre-filter, carbon filter, and micron hollow fiber membrane. First, the pre-filter removes any silt worms, rust, or large contaminants from the drinking source. Next, the carbon filter removes contaminants such as chlorine, heavy metal ions, and more potential carcinogens. Lastly, the hollow fiber UF membrane filters particles. It captures more than 99.9999% of bacteria, mold, protozoa, and more, leaving you with clean drinking water. All you’ve got to do is fill, press, and drink. It’s that simple. 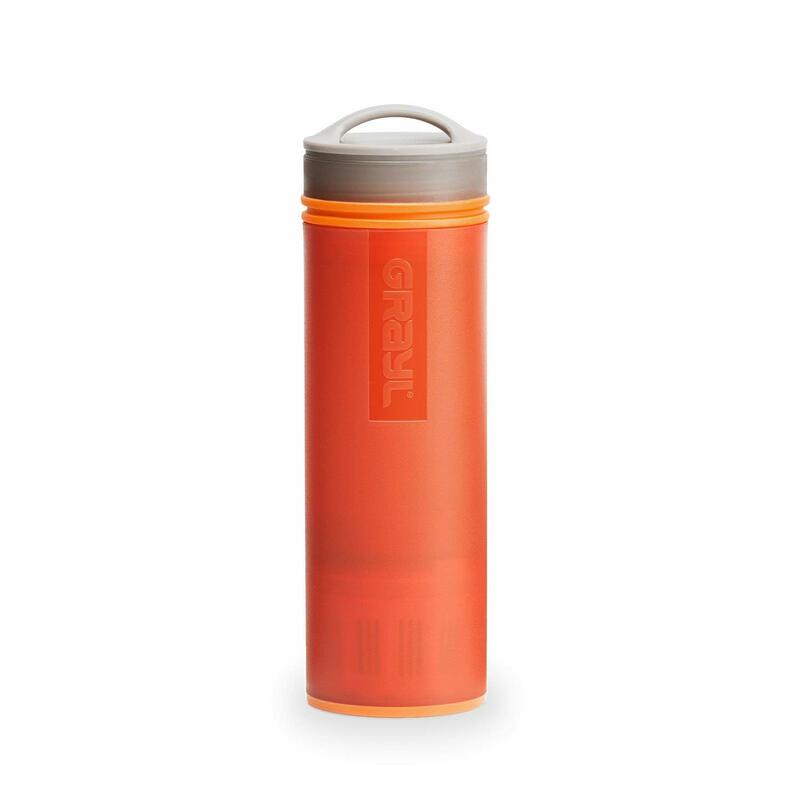 You can see why we have the GRAYL Ultralight Water Purifier on our list of the best portable water filters. Enjoy safe drinking water on any adventure. This bottle surpasses what you would expect for standard filtration. It protects against the entire spectrum of pathogens from chemicals and heavy metals to pathogens. So whether you’re drinking water from the trail or a sketchy hotel sink, GRAYL has you covered. With this said, the Ultralight Water Purifier is certainly geared for outdoor adventures. If your travels take you a bit off the grid, you can rest easy knowing you’ll be able to get safe, clean water easily. It’s the ultimate travel companion. Compact and easy to use, it slides into standard backpack side pockets and is safe for airport security. Every Ultralight style from GRAYL comes fully equipped with a replaceable purifier water cartridge. This will last you for about 40 gallons or 2-3 months of drinking water. If you wanted to, you could extend the life of your bottle indefinitely. The best part of it all is how easy it is to use. Simply use your body weight to leverage a mechanical advantage (aka press a button). Nothing could be easier. There are no messy hoses or pumps and no batteries or harsh chemicals required. In just fifteen seconds, you can enjoy clean, pure water. Like the Etekcity filter straw, GRAYLS purification process is threefold. First off, technologies of ceramic fiber provide a strong base. Second, positively charged ions latch onto impurities through ion exchange. These impurities are pulled into the cartridge while clean water is allowed to flow through. Last but certainly not least, activated carbon absorbs chemicals and heavy metals, leaving water that tastes great. So go ahead and take this filter anywhere. It was built for rough environments. Looking for the best portable water filters? This travel-friendly personal water filter from LifeStraw is amazing. Thanks to hollow fiber membrane technology, you can experience clean drinking water anywhere at any time. Rest easy knowing that all of their filters have been vigorously tested. For only $20, you’re getting such a steal. Over the course of its use, the filter from LifeStraw can transform some 1,000 gallons (4,000 Liters) of contaminated water into drinking water. To give you some perspective, this is way more than the average person drinks in an entire year. Weighing in at only 2 ounces, you can easily slip it in your pack and forget about it until you need it. There’s no reason to be lugging around heavy canteens for your camping and hiking trips. So what exactly does it do? 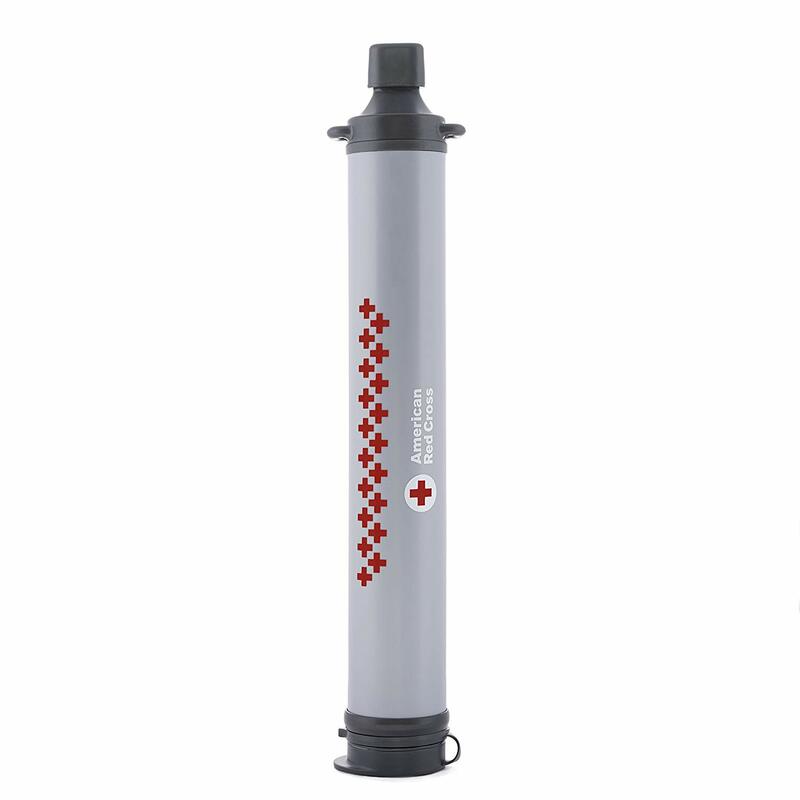 Well, with the microfiltration membrane, the filter removes some 99.999999% of waterborne bacteria and parasites. Next, it removes microplastics down to 0.2 microns. All of their numbers are backed up by testing protocols set by the EPA. Enjoy all the water you need while you are on the go. 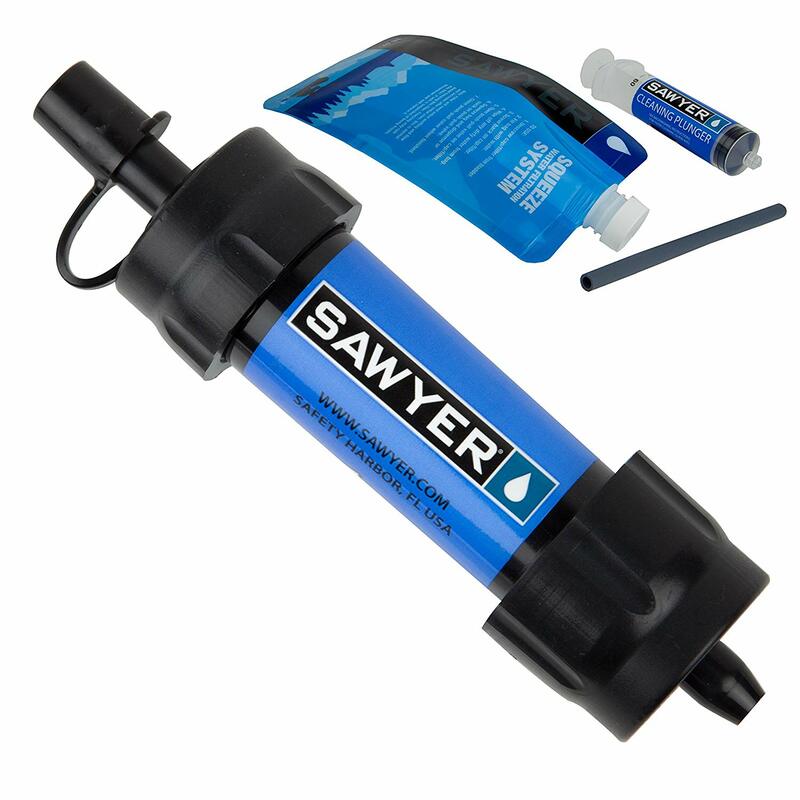 Thanks to Sawyer, this mini water filter will make all of your travels easier. Weighing only 2 ounces, it easily fits in the palm of your hand and won’t add bulk or unnecessary weight to your pack. Here’s the interesting part. Despite its size, this style is one of the best portable water filters on the market. It has been tested with 10 million parts of bacteria and one million parts of protozoa. Not a single one passed through. Size, convenience, and performance come together to make the perfect travel accessory. The Sawyer MINI Water Filtration System is perfect for anything from camping with the family to embarking on a solo hiking adventure. Plus, it comes with all of the accessories you need to use the system properly. To use the filter, attach the 16-ounce reusable squeeze pouch or drink directly from the filter itself. The filter can also be easily screwed onto most disposable water bottles. Attach your hydration pack too; there are no adapters required. It’s all possible with absolute micron filtering technology. So what is the filtering technology and how does it work. At the most foundational level, the filter is composed of microtubules that allow water to enter in through micro-pores. The higher the number of those tubes, the greater the water flow rate. This flow rate makes it unnecessary to store water. Each filter is so small that it is nearly impossible for harmful bacteria and contaminants to pass through. Are you going hiking or camping for your next trip? The Survivor Filter PRO is perfect for filtering water - whether your group is large or small. A portable size and lightweight construction, it’s just the right addition for your daypack accessories kit. Use it whenever water sources look a little questionable. As one of the best portable water filters, USA labs shoe it removes 99.999% of protozoa and pathogens. Thanks to triple filtration, it also filters out heavy metals and chemicals. With a fast flow rate, you can use it directly in a fresh water source. If you don’t love the Survivor Filter PRO, the company will refund 100% of your purchase. It also has a lifetime warranty. LifeStraw has done it again. This time, they’ve made one of the best portable water filters the whole family can use. Knowing you will have access to clean, safe drinking water is one of the best things you can do when traveling abroad. LifeStraw Family removes bacteria, viruses, parasites, and more with their smart gravity-powered filter. Whether you’re camping, hiking, or venturing elsewhere abroad, rest easy knowing you’re in good hands. Simply fill up the bucket and then collect clean drinking water in just a few minutes. Gravity filters offer the fastest systems. You’ll never have to pump out the impurities again or wait for chemicals to react. This filter is long-lasting and will get you to about 18,000 Liters or so. 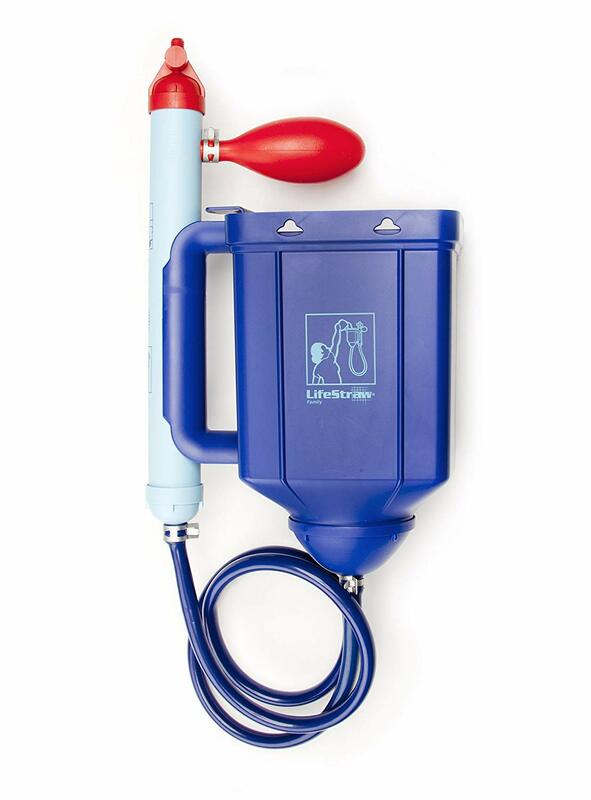 When it comes to emergency preparedness, investing in the LifeStraw Family 1.0 Portable Gravity filter is a smart move. In the event of a natural disaster or other emergency, clean water is often not easy to come by. Plan ahead and pack smart. This water purifier does not require batteries and there are no moving parts to replace either. Last but certainly not least, for each LifeStraw product you purchase, a school child in need will be given a product to receive clean water for an entire year. Safety tested and traveler approved. 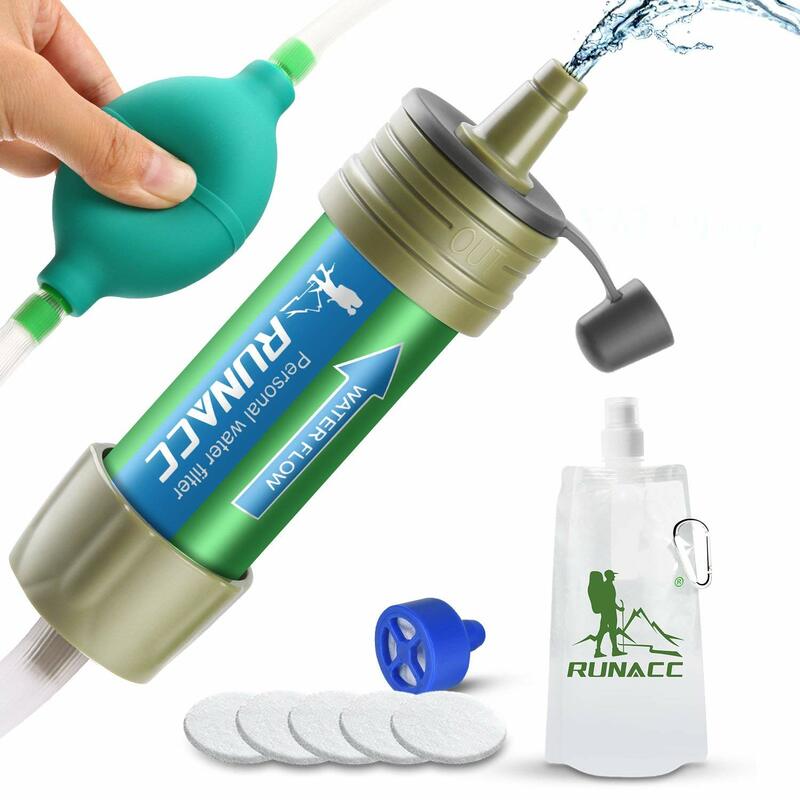 This system from RUNACC is one of the best portable water filters out there. Featuring a mini filter water kit, it is made from super ultrafiltration membranes and durable silicone. Thanks to the ball pump, drinking pure water is as easy as a tap away. In its lifespan, the Camping Straw Hydration System can provide up to 2,000 liters of fresh water - free from chemicals, metals, and harmful bacteria. This is filtering you can rely on. With the help of the purifier straw and a 0.1 micron membrane, 99.99999% of pathogenic bacteria are removed. You can count out rust, silt, and dirt too. A fast drinking design brings you all the water you need when you need it most. The straw also has a wide application of use. Pair it with your favorite hydration bladder, storage pouch, the bottle you have on hand, and more. The best part is that the kit weighs only 10 ounces, so you won’t be carrying a lot of weight on your back. We hope you enjoyed reading our article on the best portable water filters. Now that you know about the specific types of portable water filters and their features, you’ll have a much easier time picking the right one you need. Good gear makes all the difference when you’re exploring the great outdoors. With the best portable water filters, you won't have to carry around heavy jugs and canteens again. All of the filters on our list work well, are affordable, and compact. Slip it into your daypack and head out on your way. You will forget it is even there until you need it. These filters are also very easy to use. While some are operated with the press of a button, others yet take advantage of gravity to do the work. Either way, you will enjoy peace of mind knowing you will always have access to clean, fresh drinking water. Do you have a favorite portable water filter that isn’t listed here? Let us know. We’re always on the lookout for new, top-notch gear. If you have any questions or comments for us, we would love to hear them as well. Feel free to leave us a message below. We will be sure to get back with you shortly.